A delicious cup of coffee is art and science combined; the art of extracting rich flavors and aromas from coffee beans and the science of time and temperature colliding in just the right way, at just the right moment. 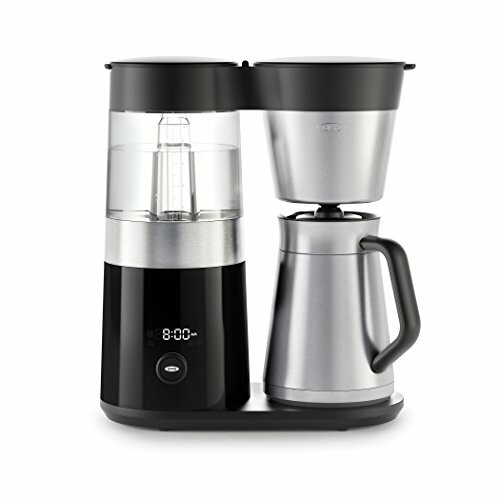 The OXO Barista Brain Coffee Maker heats water to the optimal temperature to help your favorite roast reach its full potential and precisely maintains the temperature throughout the entire brewing process. Water is pumped to the brew basket in perfectly timed cycles, starting with a short cycle that allows coffee to bloom for full flavor extraction. The intelligent microprocessor monitors time, temperature and volume from start to finish, ensuring the precision of hand-crafted coffee with the ease of ordering at your favorite local coffee shop. You choose the number of cups and we'll do the rest, creating a pot of perfection every time. The experts agree: Our Barista Brain Coffee Maker consistently brews gold-standard coffee from the first cup to the last, as certified by the Specialty Coffee Association of America (SCAA). NOTE: PRODUCT IS ONLY COMPATIBLE WITH 110V OUTLETS AND CANNOT BE USED WITH TRANSFORMERS. WARRANTY IS VOIDED OUTSIDE OF THE US. WARRANTY IS VOID OUTSIDE OF THE USA. The OXO Better Guarantee: If you experience an issue with your OXO product, get in touch with us for a repair or replacement. We’re grateful for the opportunity to learn from your experience, and we’ll make it better.